When people find out what I do for a living their first question is always about the most horrendous case of child abuse I’ve encountered. I can be at a backyard barbecue or at a New Year’s Eve party or in the waiting room at the dentist’s office, or my husband’s baseball game. You must see so much, they say, shaking their heads, lips pursed in something like empathy, like I was the one who might have endured the beatings, the burns, the torrents of hateful words. Of course I don’t share any details about my clients and their families. So much has been stripped from the children that stagger in and out of my orbit; the very least I can do is honor their privacy. Come on, people urge, tell me. It’s bad isn’t it? Like I’m dangling some salacious gossip in front of them. Like I’m keeping mum because I don’t want to offend their tender ears, upset their perfectly ordered worlds where all children are touched with gentle hands, spoken to with loving words and tucked warmly into beds with full stomachs. Close your eyes, I once told the shortstop’s mother and she did, almost quivering in anticipation of the gory details. She nodded in compliance, cocking her head in my direction, preparing for what I will reveal next. Will I tell her about Mariah Crane, the seven-year-old whose mother held her head under water until there was no chance that her damaged brain could ever catch up with her growing body? Or will I tell them about the twins? Everyone has heard about the Twin Case, as it’s still known. Everyone wants to know more about the twins. Now imagine the vilest things that can be done to a human being, I say. I let her think about this for a moment and I can see the slight spasm of revulsion skitter across her face. That’s what I’ve seen. She opens one eye to see if I’ll say anything else. But that’s all I have for her. The only people I talk to about the Twin Case are my husband and Joe Gaddey. I was a newly minted social worker, just out of graduate school when I moved back to my hometown of Cedar City, the second largest city in Iowa, just behind Des Moines with a population of about one hundred ninety-five thousand. My husband moved to Cedar City to teach high school history and coach baseball, having grown up in the tiny town of Broken Branch, Iowa, where everyone is related, if not by blood then by marriage. We met through mutual friends and eventually settled into married life, ready to change the world. In the end I have struggled to not let the case change me. Adam and I hadn’t even met yet when I was assigned my first social work case involving a set of six-year-old twin boys, a five-year-old girl, their mother, their father and a baseball bat. Only one of the boys survived. The family wasn’t new to the system; I had inherited the case from my predecessor and arrived for the first of my scheduled visits just as the emergency personnel were bringing out the first stretcher. Joe Gaddey was the officer positioned outside the front door. In a daze I moved toward him. “Their dad happened,” he said in that wry way I have grown to appreciate over the years. I swallowed back the bile that had collected in my throat, willing myself not to vomit. I knew this job would be difficult, even heartbreaking, but nothing, nothing, had prepared me for this. I felt the police officer’s gaze on me. He was massive. Six-three, two hundred and ten pounds of muscle, a thirty-six-year-old with a baby face and a sharp tongue. “You going to be okay?” he asked. We stood there for a moment. Me nodding my chin up and down like some maniacal bobblehead doll and the officer standing there uncomfortably. “You should probably call your supervisor,” he finally said as the second, third and fourth stretchers emerged, shrouded in black body bags, two of which were child-sized. “Yeah,” I said, still nodding. Every day I chronicle the monstrosities inflicted upon children in volumes of paperwork, in endless meetings, while testifying in court. I rarely talk to my husband about my clients anymore. He can see what kind of day I’ve had by the look on my face, the sag of my shoulders, how quickly I make a beeline to the bottle of pinot grigio I’ve reserved expressly for the more difficult days. On these days, Adam understands that there are no words and will gently replace my wineglass with our eleven-month-old daughter. Avery will wrap her chubby arms around my neck and press her petal-pink lips against my cheek so that I can smell the scent of apples on her breath. Whenever I come through the door it’s like Christmas, her birthday and the Fourth of July all at once, she is always so happy to see me. I could take comfort in this, and I do, but I see the same delight on the faces of the children I work with who are reunited with a mother or father. The same mothers or fathers who once slapped them so hard that teeth were loosened or grabbed them so roughly that bones were broken. In Avery I see the same spark that’s in their eyes, the eruption of the same joyful grin. I knew you’d come back to me, their faces say. I know the psychology behind this—why an abused child will run into the arms of their abuser—but it makes me sad. There is one case I do not talk about anymore, one that I am not able to speak of, not to Adam, not even to Joe. It was a case that I knew would end badly, I felt it in my bones the moment I walked into the home, and I was right. As a social worker, I was obligated to follow through, though based on what the nurse shared, I didn’t think I’d find anything that was actionable, but at least the father would know that someone was paying attention to the way he was interacting with his wife and his daughter. Three years later Madalyn was dead and I knew James Olmstead had killed her and he got away with it. Most often Madalyn comes to me in the violet-tinged mornings. That middling space between night and day. She has the sweet, unformed features of a toddler and sparkling gray eyes recessed above full, pink cheeks. Surprisingly, considering the way she was found, it wasn’t the most gruesome of deaths—very little blood and only a few bruises marred her perfect little body. It was the hidden, internal injuries that killed Madalyn. Still Madalyn’s short time on earth began with the violent expulsion from her mother’s womb into the cold, unforgiving earthly air and ended in violence, as well. It just couldn’t be proved. I knew differently and I think her mother did, too. Though she was too blind, too scared to say so. When I wake up in the mornings, as the memory of Madalyn creeps beneath the covers with me and my snoring husband, my children sleeping soundly in the rooms down the hall, over and over I try to parse out just how her father, James Olmstead, got away with murder. I’d been in and out of the Olmstead home for years because of suspected abuse by the father. Neighbors to the Olmsteads would call the police because of loud fighting coming from the house. Twice Madalyn had to be removed from the home because the father had beaten the mother so badly. Twice, the mother didn’t press charges. Twice, Madalyn was returned to the home. There were contusions on Madalyn, but the kind you find on all children: skinned knees, bruised elbows, purple knots on the forehead. All explained away by Madalyn’s mother. Such a busy little girl. You have children, right? She was right, I do have children. Just before Madalyn died, Lucas was four and Leah was seven and they had the exact same kind of bruises. But as social workers, we know. We know which homes hold the addicts, the predators, the abusers. We just can’t always prove it. Two years ago, on a beautiful May afternoon, Madalyn Olmstead tumbled out of the third-story window of her apartment building and fell to the concrete sidewalk below. The only other person in the apartment at the time was her father. “She was out of my sight for only a second,” her father claimed. “She thought she could fly,” he cried convincingly to the news cameras. During the autopsy, besides the traumatic head injury, the medical examiner found suspicious bruising on Madalyn but not suspicious enough to call it murder. Because of his neglect, Madalyn’s father was arrested for child endangerment that resulted in the death of a child and was facing up to a fifty-year prison sentence. Even though I was convinced that this was no accident, at the time I was satisfied that James Olmstead was being tried for the lesser charge and would have been content just having him put in prison. I prepared to testify against James. Over and over I reviewed the documentation of my visits to the Olmstead home, practiced describing the injuries I saw on Madalyn’s mother, the suspicious bruises I saw on Madalyn. The jury never heard my testimony. It can be very difficult for the prosecution to get a defendant’s prior bad acts entered into evidence, and the judge in this case felt that the facts would prejudice the jury too much. Our only hope was that the defense would open the door by providing testimony that it was all a mistake, that James’s character was much different than what he was alleged to have done. That he just wasn’t capable of hurting his daughter. The defense didn’t open that door, didn’t bring James’s moral fiber into testimony, didn’t have his wife or his co-workers at the foundry where he worked, nor the parents of children he coached in Tiny Tot T-Ball, speak on his behalf. Didn’t have James testify on his own behalf. As a result, the jurors were not allowed to hear of James’s abusiveness. He was acquitted. Too much reasonable doubt, the jury foreperson explained after the trial was over. Three months later, James and his wife sued the owner of the apartment building for not insuring that the window screens were safely installed. They won a tidy sum of money and were from then on known as the victims. I just knew that James had beaten his daughter and then panicked. In my gut I knew he made it look like she had climbed onto the windowsill, fallen through the screen and tumbled three stories to the sidewalk below. Madalyn was a fear-filled little girl. She was afraid of water, was afraid of dogs, was afraid of strangers, and was, most likely, afraid of heights. There was no way that Madalyn Olmstead would climb onto a windowsill and press her little hands against the screen. Never once in all the time I spent with her did she ever tell me she wished she could be a bird, wished she could fly. One thing I knew of for sure was that Madalyn was afraid of her father. Adam’s lack of concern irked me a bit, but Caren’s and Joe’s dismissal truly hurt. In social work and police work, too, we not only deal with facts but gut instinct often prods us into action. I thought they would listen to my worries and would back me up when I suggested another in-depth investigation into Madalyn’s death. They were sympathetic, made all the right noises when I made my case to them, but in the end they said they were satisfied with the jury’s decision and I needed to drop it. In the end all that was left was the man who got away with murder, the woman who chose to protect him, and me, the social worker who was powerless to protect a four-year-old little girl named Madalyn Olmstead, who will forever be known as Little Bird, the little girl who thought she could fly. Like many parents, Ellen struggles to balance her personal and professional lives. Discuss how you face maintaining that precarious balance between home and work. Ellen’s former client Jade stepped in to save Avery’s life and Ellen found herself being seen as an unfit mother. Talk about this reversal of roles. How do you think this changed Ellen’s view of the parents she works with, how they think of Ellen? Does this change your opinion of parents who might have experience in the child welfare system? Discuss the ways parenthood and adult-child relationships are portrayed in the novel. Think about Jenny’s relationships with her father, mother, Maudene, her father’s friend-girls and Ellen’s relationship with her own children and the children she works with as a social worker. Ellen’s distractions had catastrophic effects on her daughter’s health, her family, and her professional life as a social worker. Talk about a time when you may have had a close call in your life. How did you feel? How did the experience change you? Ellen was charged with a felony and potentially faced a prison sentence. Do you think she should have had to serve time behind bars? Why or why not? What scenes or developments in the novel affected you most? Adam quickly forgives Ellen for leaving Avery in the hot car. How would you react in a similar situation? Does Ellen deserve forgiveness? Do you think she will be able to forgive herself? Maudene places herself in a precarious situation by taking a wayward Jenny into her home. Discuss the possible implications of this decision. What would you have done if faced with a similar situation? How do Ellen and Jenny change over the course of the novel? Which character changes the most, which the least? How did your opinion of Jenny’s mother change over the course of the novel? Why or why not? In Jenny’s young life she has already faced so many obstacles: poverty, abuse, struggles with school, a runaway mother and an unpredictable father. What do you think will become of Jenny? 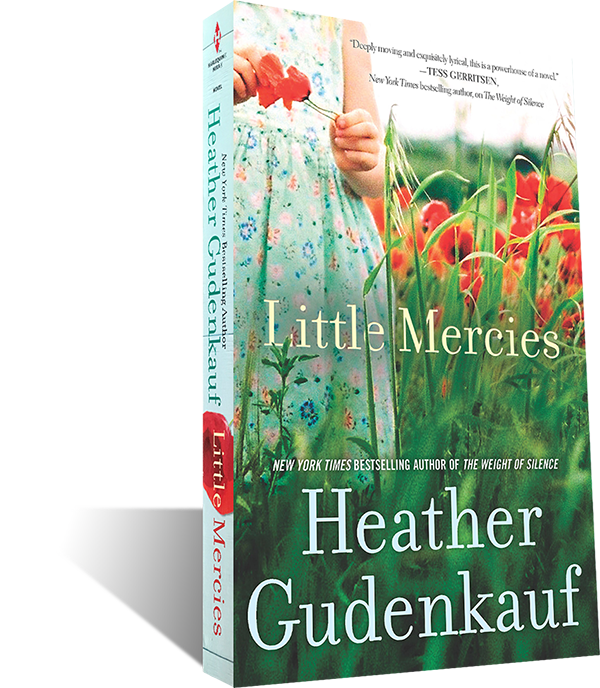 What does the title Little Mercies mean to you? Veteran social worker Ellen Moore has seen the worst side of humanity– the vilest acts one person can commit against another. She is a fiercely dedicated children’s advocate and a devoted mother and wife.But one blistering summer day, a simple moment of distraction will have repercussions that Ellen could never have imagined, threatening to shatter everything she holds dear, and trapping her between the gears of the system she works for. Listen to a Little Mercies audio clip here. ChicagoNow.com names LITTLE MERCIES a Best Books for the Beach!